Big day today for me possibly, the Global News contacted me, the reporter that I have seen on TV for many many times said he was fascinated and needs to come and talk to me so today is that day unless something changes. It will be on TV later, this evening I think. 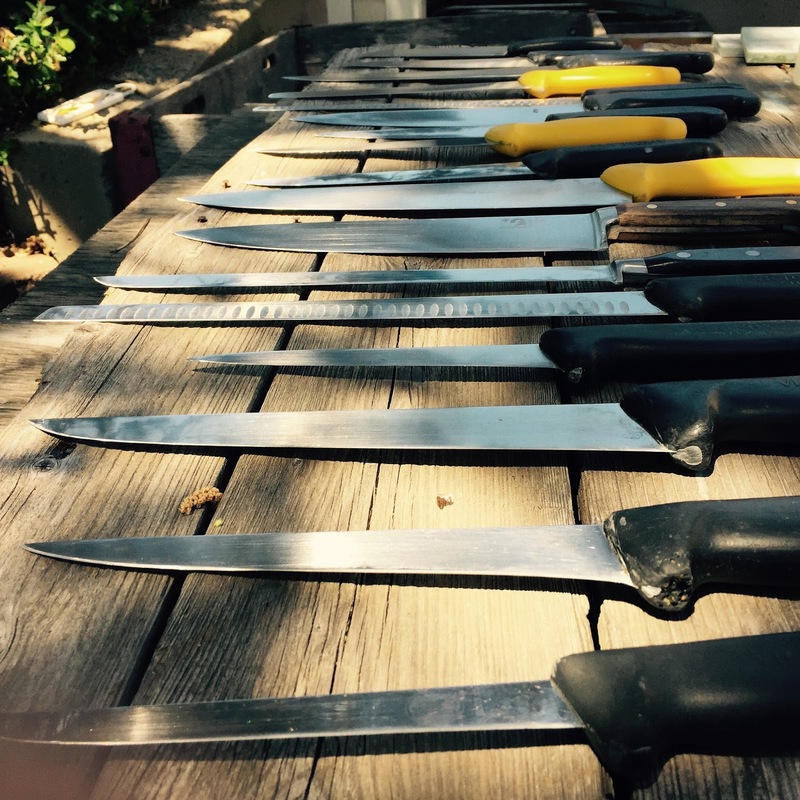 Repairs: When I started sharpening seriously and opened my business it was all about sharpness, all I was worried about was making people happy for the money they spent. After a short amount of time I realized that that was the easy part. As you all know, most knives are different and I get them in all sorts of condition. The best ones to sharpen, besides the hand made Japanese knives are newer knives that have not been sharpened beyond the factory edge. The worst are the ones that have been subjected to Steel abuse and they require much work. 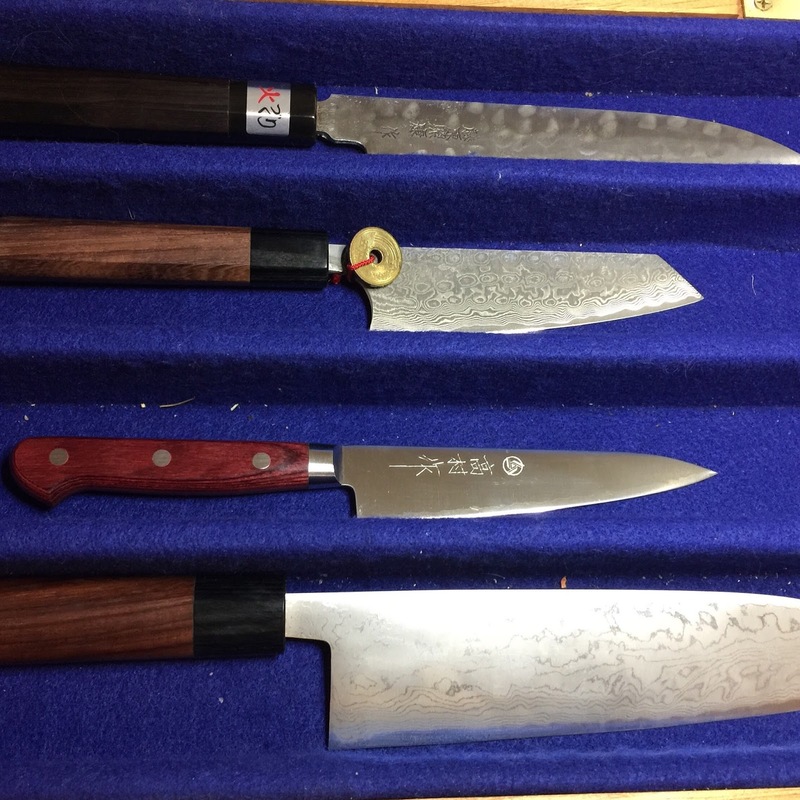 Then it was the broken knives that came, I was admittedly unprepared for the onslaught of damaged knives, chipped, minor and gaping wound chips, broken tips and and damage as a result of a grinder. 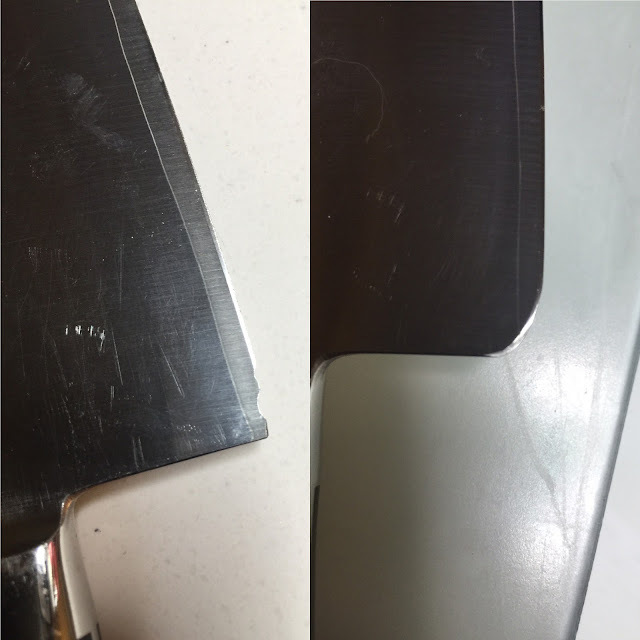 Now the good thing about this is that anything I did was an improvement but it certainly added a new dimension to my sharpening routine, a new challenge. In order to become confident with repairs I simply broke a lot of my own knives and went to town on them figuring out the best way to fix them. I purchased a 1 X 42 inch belt sander and some Trizact belts and used that for major work. 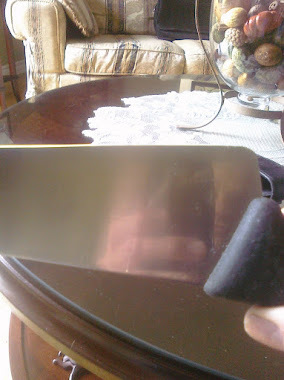 I never have used it to sharpen a knife, just for the ugly stuff. I use it to get started then move on to my beloved stones. You can see above that this was a major repair, in my books anyway and I did use the belt sander for a lot of this. 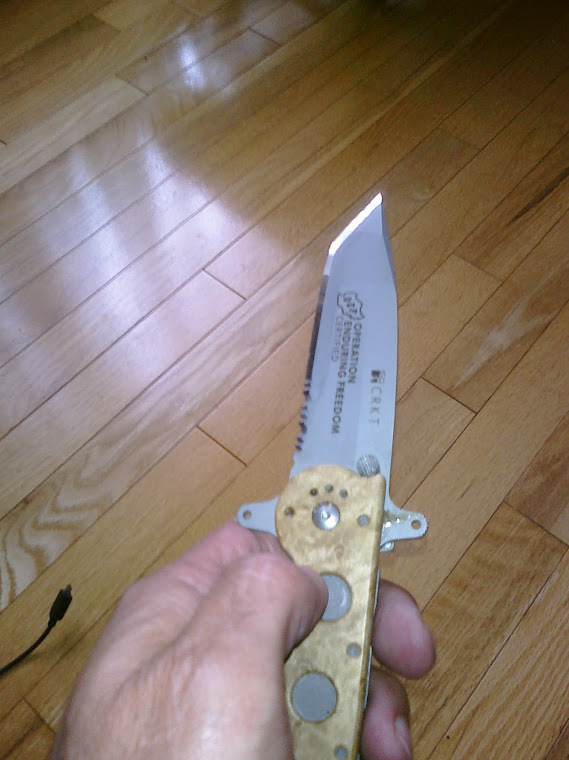 Yes it can certainly be repaired using a coarse stone but I am not going to spend an hour scraping the life out of my beautiful coarse stones for a $30.00 knife. Besides, I think I can actually do a better job with the BS, I work from the spine mostly. I thought of this a lot before I went to work. 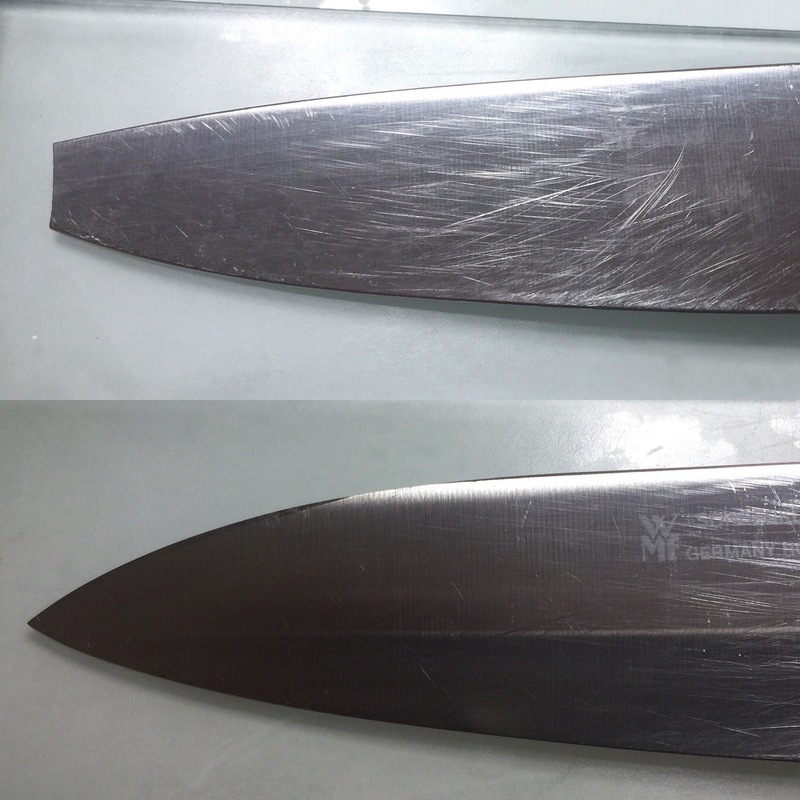 If I removed metal from the edge and worked upwards towards the spine, the metal at the "new" tip would be very thick, nice and strong but very thick and may look weird. (I did this before on purpose because I knew the knife was going to be abused). So for this particular blade I worked from the spine down to the tip. This way you don't lose any real estate either, more than necessary that is, the owner already lost some but that's not my fault. This was a difficult one because the knife is a Henckels Twin Cermax and it is extremely hard, one of the hardest in the world at 66. I used stones for this repair and to minimize the impact on the primary edge, I simply rounded off the heel, seemed to make the most sense to me. I am sure anyone would figure that one out. 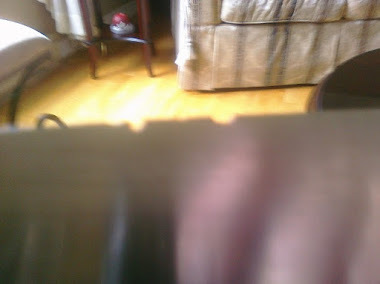 ( I mean rather than remove metal along the edge until that chip disappeared, yes the knife would retain it's original shape but it would lose a substantial amount of metal from that precious edge. That's all for now, thanks for looking. Here are some random but recent pictures. You know I appreciate you being here. Thanks for sharing. I thought you were using one of those lower speed wet stone wheels (http://tshop.r10s.com/818/5f4/14de/9a8b/20d7/a392/710e/1103e5b81b0050569958db.jpg) in order to avoid damaging the heat treatment. I guess that using the belt sander requires certain training, doesn't it? I agree with you: Using just a whetstone, even a coarse one, would not be productive when a major repair is needed. Hi, great question. I wish I had one of those stone wheels, maybe someday. The belt sander I use has a pretty low speed setting and I am constantly dipping the blade in water to prevent overheating. 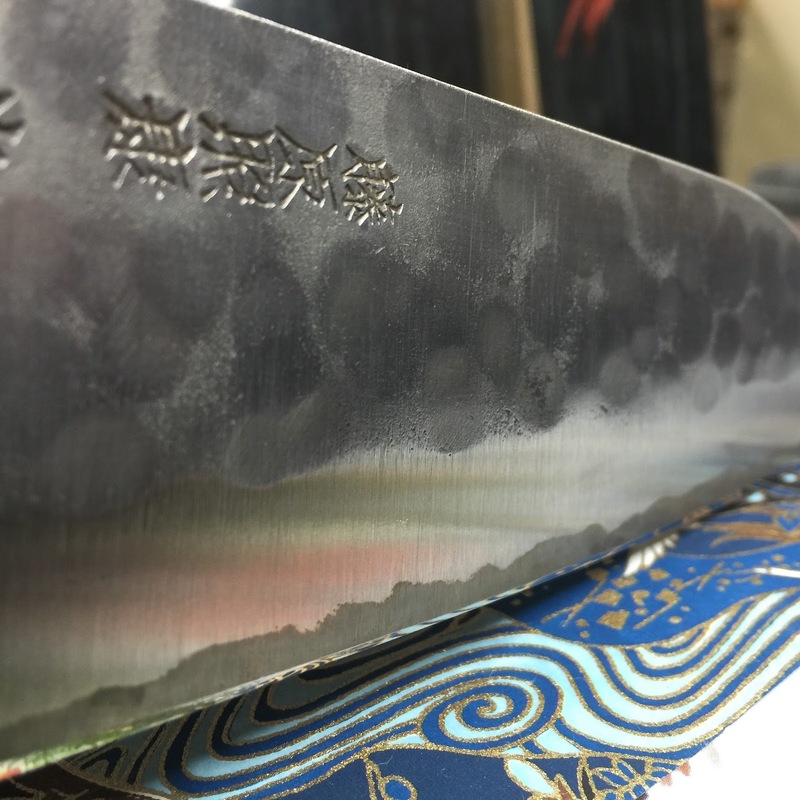 During my learning process, I tested this at length and I saw how hot the blade can get. However I since got a much better belt sander. As for the certain training, yes like anything else it does but there are some good videos out there. I do not enjoy using it for sharpening at all, but some folks have built their business around it.